The most concrete evidence of the practice of reflexology in ancient culture was the discovery of the above wall painting depicting the practice of hand and foot reflexology in the tomb of Ankhmahor (highest official after the Pharaoh) at Saqqara, which is also known as the physicians tomb. This Egyptian wall painting is dated at the 6th dynasty, about 2330 B.C. Prior to this discovery it was widely believed that reflexology had ancient origins and frequent conjecture was made about it's relationship to and development alongside the ancient Oriental practices of shiatsu and acupuncture. Similarly, North American Indian medicine men are believed to manipulate and stimulate the feet as a part of their healing practice. It was, however, a Dr. William H. Fitzgerald who advanced and developed the initial popular practice of reflexology in our contemporary Western society. Dr. Fitzgerald studied at the University of Vermont and graduated in 1895. For two and a half years he practiced medicine in Boston City Hospital before transferring to the Central London Ear, Nose and Throat Hospital, England. He also practiced under the famous Professors Politzer and Chiari at an ear, nose and throat clinic in Vienna. How Dr. Fitzgerald originated his research in this area remains a mystery. Conjecture has been made that he discovered his ideas in Europe and brought them to North America. Alternatively, it is suggested that, in his desire to develop a method of anesthesia and analgesia for minor surgery, he noted the instinctive tight gripping of a chair arm by patients in their response to pain, and began to explore that phenomenon. In 1913 he brought his initial findings to the attention of the medical profession while he was head of the Nose and Throat Department of St. Francis Hospital in Hartford, Connecticut. He had discovered that pressure, when applied to certain points on the body could relieve pain and improve the functions of certain organs of the body. In his research Dr. Fitzgerald developed a new system of ten zones running from the top of the head to the tips of the toes and hands. Dr. Edwin Bowers, medical critic and writer, investigated Dr. Fitzgerald's claims, appeased his scepticism, and jointly authored with Dr. Fitzgerald the book "Zone Therapy" - the name by which reflexology was known until the early 1960's. Eunice Ingham, who initially worked with Dr. Fitzgerald as a physical therapist, gave Dr. Joe S. Riley, one of a number of doctors and dentists who practiced Zone Therapy and helped develop it, credit for teaching her. Eunice Ingham is generally recognized for her untiring devotion to and promotion of Zone Therapy. She toured North American cities annually giving Zone Therapy seminars, published charts and her two books: "Stories The Feet Can Tell" (1938) and "Stories The Feet Have Told" (1951), and established the "National Institute of Reflexology". Most authors of books and teachers of foot reflexology have acquired their basic knowledge directly or indirectly from Eunice Ingham's teaching. Eunice Ingham's nephew, Dwight Byers and his family have continued where Eunice Ingham left off with her death in 1974. In 1961 the profession of physiotherapists objected to the word "Therapy" in the name "Zone Therapy". Hence, the name 'reflexology' was adopted. Presently, the professional practice of reflexology has been integrated into the mainstream provision of health care in three countries: China, Denmark and the United Kingdom. 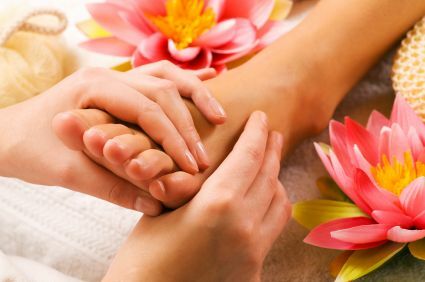 In countries all over the world reflexology is quickly being embraced for it's provision of enhanced health, profound relaxation and pleasure, coupled with it's simplicity and harmless nature.